So let's just move on to some of my favorite tips from Mahatma Gandhi. If you change yourself you will change your world. If you change how you think then you will change how you feel and what actions you take. And so the world around you will change. Not only because you are now viewing your environment through new lenses of thoughts and emotions but also because the change within can allow you to take action in ways you wouldn't have – or maybe even have thought about – while stuck in your old thought patterns. And the problem with changing your outer world without changing yourself is that you will still be you when you reach that change you have strived for. You will still have your flaws, anger, laziness, negativity, self-sabotaging tendencies etc. intact. And so in this new situation you will still not find what you hoped for since your mind is still seeping with that negative stuff. And if you get more without having some insight into and distance from your ego it may grow more powerful. Since your ego loves to divide things, to find enemies and to create separation it may start to try to create even more problems and conflicts in your life and world. What you feel and how you react to something is always up to you. There may be a “normal” or a common way to react to different things. But that's mostly just all it is. You can choose your own thoughts, reactions and emotions to pretty much everything. You don't have to overthink, freak out, worry of even react in a negative way. Perhaps not every time or instantly. Sometimes a knee-jerk reaction just goes off. Or an old thought habit kicks in. And as you realize that no-one outside of yourself can actually control how you feel you can start to incorporate this thinking into your daily life and develop it as a thought habit. A habit that you can grow stronger and stronger over time. Doing this makes life a whole lot easier and more pleasurable. Fighting evil with evil won't help anyone. And as said in the previous tip, you always choose how to react to something. When you can incorporate such a thought habit more and more into your life then you can react in a way that is more useful to you and others. You realize that forgiving and letting go of the past will do you and the people in your world a great service. And spending your time in some negative memory won't help you after you have learned the lessons you can learn from that experience. You'll probably just cause yourself more suffering and paralyze yourself from taking action in this present moment. If you don't forgive then you let the past and another person to control how you feel. By forgiving you release yourself from those bonds. And then you can focus totally on, for instance, the next point. 4. Without action you aren't going anywhere. And so you may resort to preaching, as Gandhi says. Or reading and studying endlessly. And feeling like you are moving forward. So, to really get where you want to go and to really understand yourself and your world you need to practice. Books can mostly just bring you knowledge. You have to take action and translate that knowledge into results and understanding. Move on to the next point for more on the best tip for taking more action that I have found so far. Well, when you are in the present moment you don't worry about the next moment that you can't control anyway. And the resistance to action that comes from you imagining negative future consequences – or reflecting on past failures – of your actions loses its power. And so it becomes easier to both take action and to keep your focus on this moment and perform better. Have a look at 8 Ways to Return to the Present Moment for tips on how quickly step into the now. And remember that reconnecting with and staying in the now is a mental habit – a sort of muscle – that you grow. Over time it becomes more powerful and makes it easier to slip into the present moment. When you start to make myths out of people – even though they may have produced extraordinary results – you run the risk of becoming disconnected from them. You can start to feel self-doubt and like you could never achieve similar things that they did because they are so very different. So it's important to keep in mind that everyone is just a human being no matter who they are. And I think it's important to remember that we are all human and prone to make mistakes. Holding people to unreasonable standards will only create more unnecessary conflicts in your world and negativity within you. It's also important to remember this to avoid falling into the pretty useless habit of beating yourself up over mistakes that you have made. And instead be able to see with clarity where you went wrong and what you can learn from your mistake. And then try again. Be persistent. In time the opposition around you will fade and fall away. And your inner resistance and self-sabotaging tendencies that want to hold you back and keep you like you have always been will grow weaker. Find what you really like to do. Then it will be easier to stay positive and you'll find the inner motivation to keep going, going and going. You can also find a lot of useful tips on how keep your motivation up in 27 Simple Ways to Motivate Yourself. 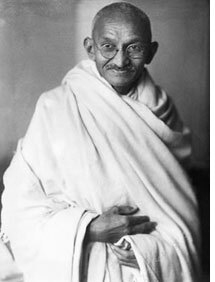 One reason Gandhi was so successful with his method of non-violence was because he and his followers were so persistent. They just didn't give up. Success or victory will seldom come as quickly as you would have liked it to. I think one of the reasons people don't get what they want is simply because they give up too soon. The time they think an achievement will require isn't the same amount of time it usually takes to achieve that goal. This faulty belief partly comes from the world we live in. A world full of magic pill solutions where advertising continually promises us that we can lose a lot of weight or earn a ton of money in just 30 days. Finally, one useful tip to keep your persistence going is to listen to Gandhi's third quote in this article and keep a sense of humor. It can lighten things up at the toughest of times. There is pretty much always something good in people. And things that may not be so good. But you can choose what things to focus on. And if you want improvement then focusing on the good in people is a useful choice. It also makes life easier for you as your world and relationships become more pleasant and positive. And when you see the good in people it becomes easier to motivate yourself to be of service to them. By being of service to other people, by giving them value you not only make their lives better. Over time you tend to get what you give. And the people you help may feel more inclined to help other people. And so you, together, create an upward spiral of positive change that grows and becomes stronger. Nowadays it's easier than ever to help people out and to start such a spiral. You can do via social media, a podcast, a channel on Youtube or you can start a blog like I did. Another tip is to strengthen your social skills. By doing you can become a more influential person and make the upward spiral I mentioned even stronger. Move on to the next tip for more on that. I think that one of the best tips for improving your social skills is to behave in a congruent manner and communicate in an authentic way. People seem to really like authentic communication. And there is much inner enjoyment to be found when your thoughts, words and actions are aligned. You feel powerful and good about yourself. With these channels in alignment people tend to really listen to what you're saying. You are communicating without incongruency, mixed messages or perhaps a sort of phoniness. Also, if your actions aren't in alignment with what you're communicating then you start to hurt your own belief in what you can do. And other people's belief in you too. But if you don't then you will, as Gandhi says, drive yourself into a false position. A place where you try to uphold or cling to your old views to appear consistent while you realize within that something is wrong. It's not a fun place to be. To choose to grow and evolve is a happier and more useful path to take. the flip side to forgiving and “letting go” is not forgetting and not allowing hurtful abusive people to continue to hurt and devalue you. find the wisdom to identify these occurances and recognize them for what they are. which leads to the flipside to “finding that good in people and help them” …i’ve always lived by this credo, but one must be careful not let their goodness and generosity blind them to the ill-intent of others. in other words, there are alot of aHoles out there who WILL take advantage of your kindness as long as you allow them. well i am indeed impressed with the level of information on this site.i belive that it will go a long way to help persons with a wrong orientation about life to see thngs on a different perspective. Please, what is the source of these “Top 10 Fundamentals for Changing the World”? Was surfing the web and came across this post. I’m currently seeking ways to improve my life. I am at the beginning of my journey and reading all of this useful information brings me hope but at the same time I know that I have a long road ahead of me. I think the words and principles of Gandhi are just as true today as they were back then. Thank you for taking the time to make this post :) I only hope that I can take something away from this post even if it is only a little something and implement it in my life somehow.